The medieval legend of George slaying a dragon to rescue an innocent maiden is represented on this fine water tank with the initials 1776. The tank is made from fibreglass and can be personalised with bespoke initials, dates or even crests at an extra cost (please contact the sales office on 01748 821500 if you're interested in the additional bespoke details). There is an optional backplate available to transform the tank into an atmospheric water feature. We have made this tank in many of our finishes, each of which is authentic. 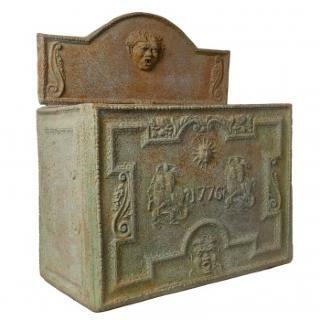 Available in Antique Faux Lead, Faux Lead and Aged Bronze.